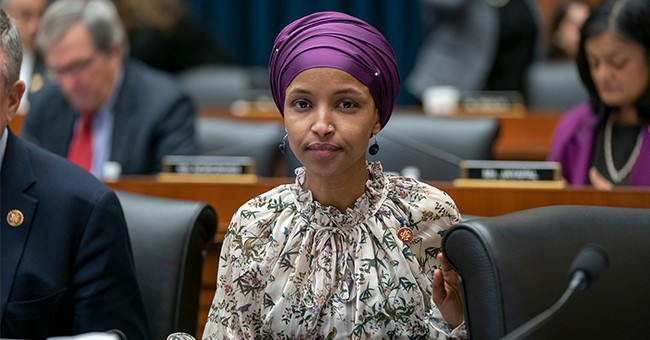 Rep. Ilhan Omar (D-MN) is not backing off of her outrageous comments about the September 11, 2001 terror attack, which she defined as, "some people who did something." We are rightly fuming over her characterization, as 3,000 Americans perished that day. But Omar's on talk shows and cable news outlets insisting she said nothing wrong and that she's only being criticized because of her Muslim faith. Her latest attempt at deflection took aim at former President George W. Bush, who was commander-in-chief at the time al-Qaeda terrorists flew those planes into the Twin Towers, the Pentagon, and another unknown destination. We all remember Bush's powerful speech at Ground Zero when he stood atop the rubble with a firefighter, grabbed a bullhorn and said, "I can hear you! The rest of the world hears you! And the people who knocked these buildings down will hear all of us soon!" Omar observed that Bush used the word "people" and not "terrorists." President Bush's words inspired Americans at one of the darkest times in our history. It was exactly what we needed to hear. We knew we had a leader who was determined to respond to this heinous attack. The terror attack, and the war that followed, weighed heavily on Bush for years. No, he was not "downplaying" any of it. Oh, by the way, Bush did rightly refer to the attack as terrorism.